Visitors to the famous international portal have reached a verdict and awarded the prize to Sardinia. Summer holidays have to be enjoyed on one of the 15 most beautiful beaches in Italy. Make no mistake, the best thing is to stretch out and bask in the Sardinian sun with its “manita” or clean sweep of 5 selected beaches. Come with us on a journey to the white beaches of Sardinia. From the La Maddalena Archipelago we follow the North Sardinia coast both towards East and West embracing the sea and finding relaxation and beauty. Let’s go to the island of Spargi, one of the pearls of the La Maddalena Archipelago, which can only be reached by sea. Nature reigns on this island, where the vivid green of the Mediterranean maquis contrasts with the brilliant shining colours of the sea. Once a hideout for pirates, it is famous for firing the imagination of all those who have landed on the island. 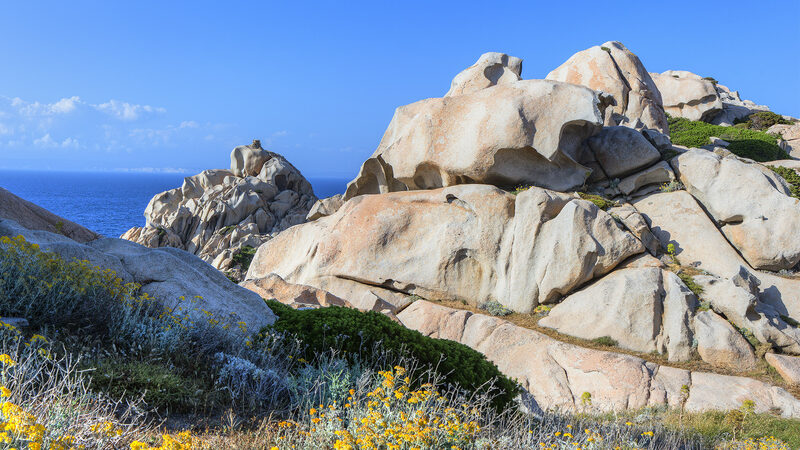 The granite rocks have been shaped by time and wind over the centuries into amazing natural sculptures. If the Bulldog stands guard over this jewel of the Mediterranean, The Witch’s Head with its hooked nose seems to want to become intoxicated with the scents of the sea. Seeing is believing! One of the most beautiful beaches in Sardinia which according to tradition caused the Prince Aga Khan to fall in love with it while he was sailing along this stretch of coast. It was a short step from here to the creation of the Costa Smeralda. A paradise of extra fine white sand washed by emerald-hued waters. Take the path that goes down to the beach, the greenery and the intense scent of the maquis will surround you. A few more steps and there it is right in front of you, divided in two by several pink rocks. It will leave you speechless. Continuing southwards along the East coast of the North of Sardinia, the beach at Capo Coda Cavallo is an oasis of peace and quiet featuring shallow waters with sandy bottoms, ideal for children’s games. Just behind is a stretch of rich green rich Mediterranean vegetation with tamarisks, junipers, strawberry trees and holm-oaks. The whole peninsula, with its unique ponytail shape and from which it takes its name, is part of the Tavolara – Punta Coda Cavallo Protected Natural Marine Area. A little stretch of sand washed by the crystal clear turquoise waters of the Gulf of Orosei. Cala Biriola is a small treasure trove of marine life which makes it a perfect destination for scuba diving or just a bit of snorkeling with mask and snorkel. During a visit to the “Sardinian Barcelona” and its enchanting coastline, make a stop at Cala Dragunara. The impressive view of the Capo Caccia promontory which encloses the Gulf of Porto Conte to the West is perfect for several hours relaxing on the golden sands. After a refreshing swim, allow yourself to a visit to Neptune’s Grotto, taking one of the boats that leave directly from the small pier on the beach.